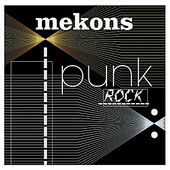 With an illustrious, 27-year career behind them, the Mekons' latest album, aptly titled Punk Rock, finds the band creating a punk rock record filled with 70s, snotty, English rock, right down to the loose, classic punk sound of the recordings. Making it feel like Punk Rock was written (if not recorded too) long ago and is just surfacing now. The record feels dated, the type of record that would be super cool and in, a timeless classic, had it been recorded in the late 70s, but oddly weird having been recently recorded and released as a new album. Still, there is a lot to say about this legendary band. And, Punk Rock is true to its form, and will probably withstand the test of time with some kid re-discovering it twenty years from now and going, "Wow, this is one of the best records from the 70s". It's either behind on the times or so far ahead of the times, we can't tell. Either, it's still good. I'll give it a B.